in a concise easy to understand manner. highlighting the most important points. and many interesting topics are covered. Bick - Avure technologies Inc.
was very detailed. Overall, this class was very informative and well structured. Teresa - JFC International Inc.
Good attention. Narrowed on topics that were helpful in understanding issues. - Carol - Babcock Lab. -Tony - Hitching Post Products. - Mavra Marti - Kerry Inc.
visualization of pathogens and process. - Michael - Food Protection Services. This is excellent course for People without a background of microbiology. - Fred - Outwest Meat Co.
- Nolberto - MICHELSON LAB. through FoodHACCP. All attendees received "Food Safety Microbiology certificate". Onsite Training in Your Plant? 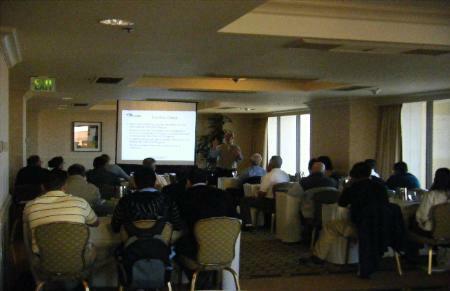 We finished more than 100 Onsite trainings for Food Safety.